John Collier (1850–1934), The Sentence of Death (1908), colour photogravure after oil on canvas original, original 132 x 162.5 cm, original in Wolverhampton Art Gallery, Wolverhampton, England. By courtesy of Wellcome Images, The Wellcome Library. The profession of medicine was formed from two quite separate trades: surgeons and physicians. Early versions of the oath of Hippocrates, the (physician) father of medicine, included an explicit undertaking that a doctor (physician) would not attempt surgical procedures such as the removal of stones from the bladder. That was a task best left to the surgeon, armed with his scalpel. Physicians, whose treatments were largely ineffective and often endangered the patient, acquired royal patronage and high status; surgeons often practised other trades, usually being barber-surgeons, and their status was often relatively low, more of a craftsman than the confidant of kings. Rembrandt Harmenszoon van Rijn (1606–1669), The Operation (The Sense of Touch) (1624-25), oil on panel, 21.6 × 17.7 cm, Private collection. Wikimedia Commons. 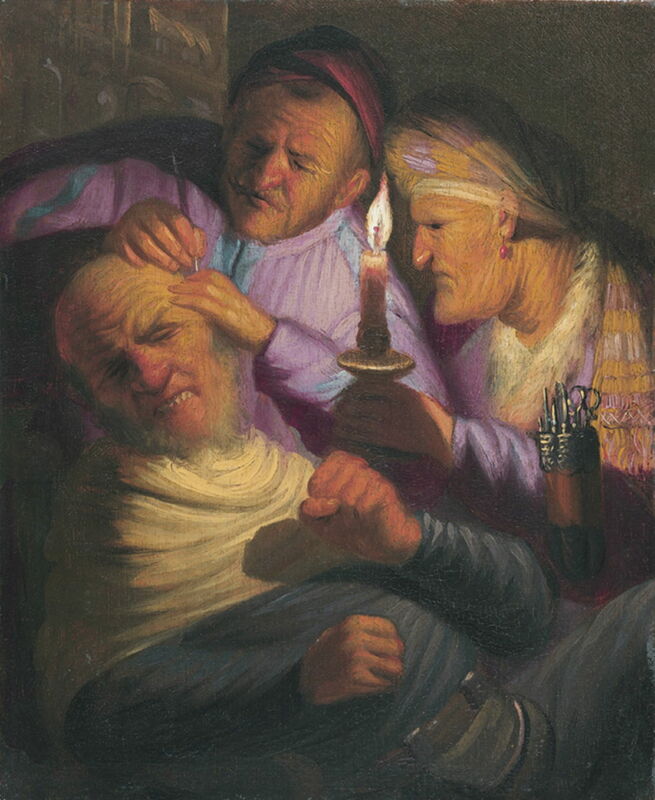 Rembrandt’s very early painting of The Operation from 1624-25 shows a barber-surgeon and his assistant performing surgery on the side of a man’s head. This is most likely to have been the lancing of a boil or removal of a tumour from the scalp or pinna of the ear. In the absence of any form of anaesthesia, this visibly resulted in considerable pain for the long-suffering patient. William Hogarth (1697–1764), Marriage A-la-Mode: 3, The Inspection (c 1743), oil on canvas, 69.9 × 90.8 cm, The National Gallery, London. Courtesy of The National Gallery London, inventory NG115. 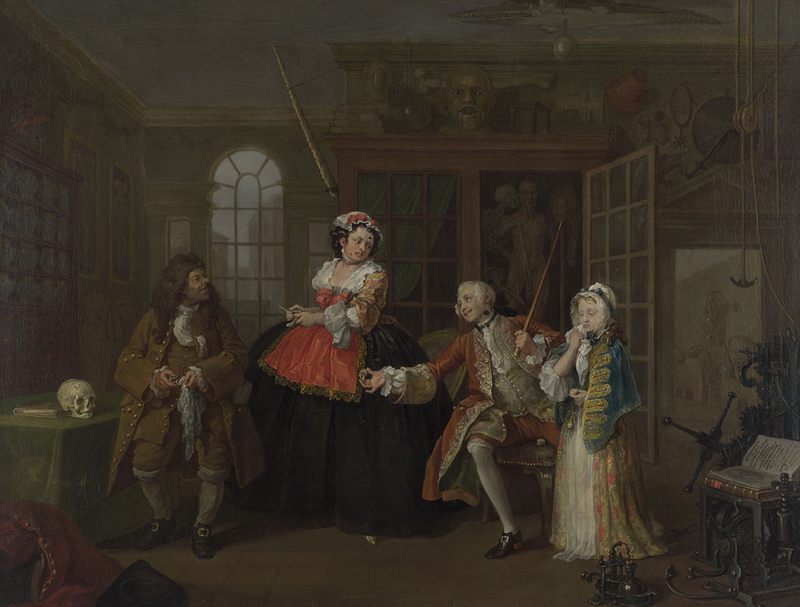 Hogarth’s The Inspection (from his series Marriage A-la-Mode of about 1743) takes us to the consulting room of a repulsive (physician) doctor, who appears to be treating his three patients for syphilis. A crucial detail which may be hard to see in the image is of a link between three small boxes of black pills: the younger woman holds one box, which is closed; a second closed box is on the seat of the chair just in front of the man’s crotch; the third is open in the man’s right hand, outstretched towards the doctor. The pills are black, in common with the poxmarks which appear on the man and the older woman, indicating that they are the mercuric salts then used to treat syphilis. A skull on the table at the left bears the unmistakeable erosions produced by advanced syphilis, and the doctor himself bears the hallmarks of congenital syphilis. All around the group are various worrying items of medical equipment and specimens. More worrying still, the older woman is caressing a cutthroat surgical blade. During the eighteenth and nineteenth centuries, advances in public health, hygiene, and science generally resulted in dramatic changes in medicine. The two separate trades gradually united, with common training, and by the end of the nineteenth century many treatments, using drugs and/or surgery, were starting to become effective. Physicians ceased being ‘quacks’, and surgeons ‘butchers’, and the unified profession built its reputation on science. Pascal Dagnan-Bouveret (1852–1929), An Accident (1879), oil on canvas, 90.7 x 130.8 cm, Walters Art Museum, Baltimore, MD. Wikimedia Commons. Pascal Dagnan-Bouveret was travelling in the Franche-Comté region in the east of France, near the Swiss border, in company with a medical friend, when his friend was called to help someone who had been injured in an accident. The artist turned that into An Accident (1879), in which a country doctor is bandaging a boy’s hand following a similar event. Although this doctor is clearly better-clothed than the patient’s family who surround him, he is working in their deprived environment, with a small bowl full of bloody water, and a filthy rag. Emmery Rondahl (1858-1914), The Doctor’s Orders (1882), oil on canvas, 43.2 x 55.9 cm, location not known. Wikimedia Commons. 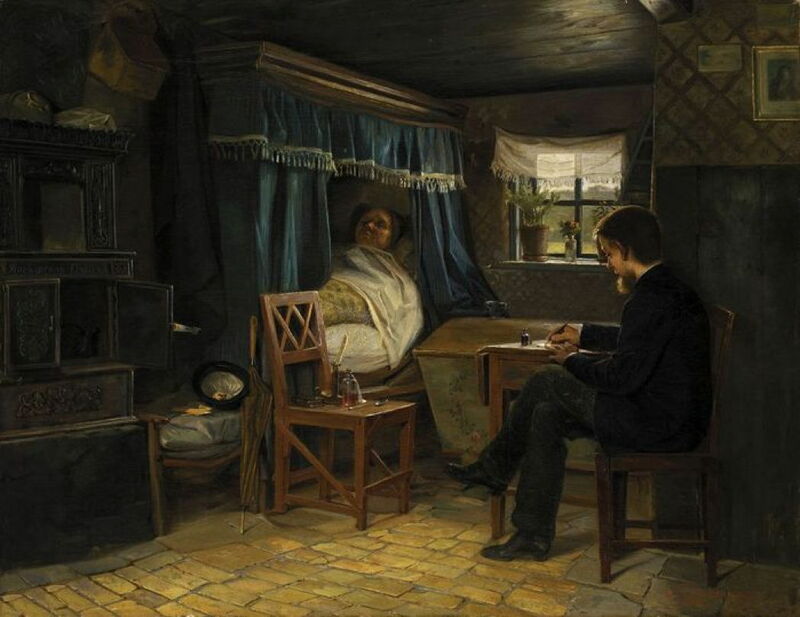 Emmery Rondahl’s The Doctor’s Orders (1882) shows another country doctor who is writing a prescription, perhaps, for an older patient who is tucked up in a magnificent fitted bed in their own home. On the chair between them, in the centre of the painting, is a candle in a holder, a bottle of medicine, and a spoon. 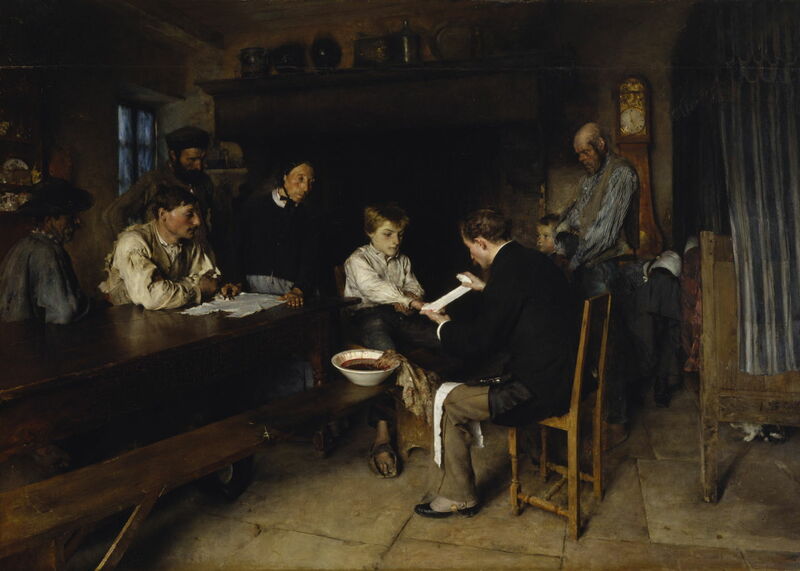 In 1877, the painter Luke Fildes’ own infant son died, a tragedy which affected him deeply. 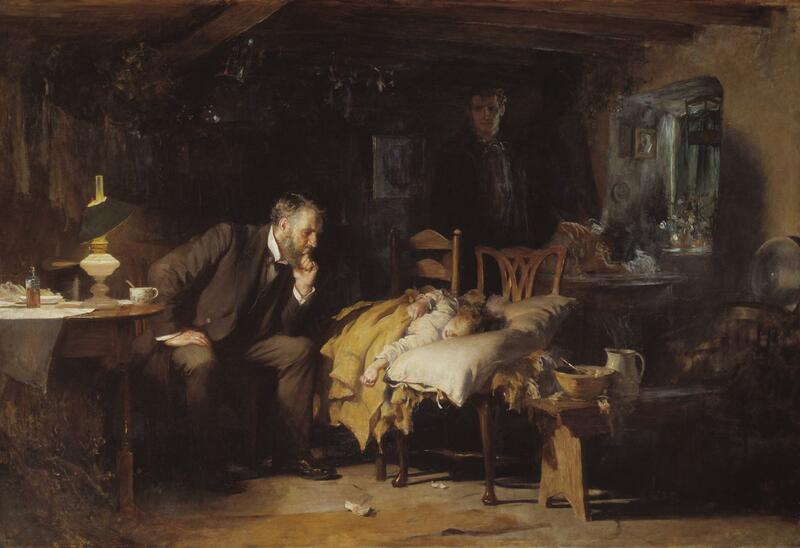 He was later moved to paint The Doctor (1891) as a commission for Sir Henry Tate (who founded what is now the Tate Gallery), which shows a family physician staring in great concern at a sick child. In the background, the child’s fisherman father rests his left hand on the shoulder of the mother, as she sobs in despair on the table. At the end of the nineteenth century, John Collier and others established a sub-genre of the ‘problem picture’, which contained a set of unresolved clues as to an underlying narrative. Designed to puzzle and encourage speculation, the newspapers of the day carried comment and correspondence arguing for particular readings of the latest problem picture. 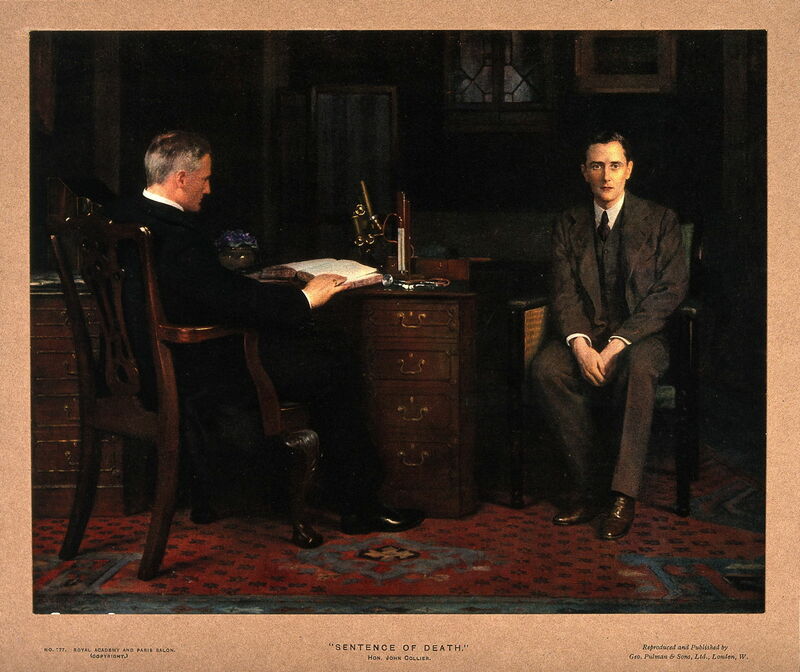 Collier’s The Sentence of Death (1908) at first disappointed his critics, but quickly became very popular with the public; the original painting has not lasted well, and I show here a contemporary reproduction. At a time when disease and death were prominent in everyday life, this painting might seem quite banal. A middle-aged man stares blankly at the viewer, having just been told by his doctor that he is dying. The doctor appears disengaged, and is reading from a book, looking only generally in the direction of his doomed patient. Unusually for Collier’s problem pictures, and for paintings showing medical matters in general, the patient is male. This led to speculation as to the expected male response to such news, and questions as to what condition might be bringing about his death. There was even debate about interpretations of the doctor-patient relationship – an issue which I will examine in more detail in the second and concluding article tomorrow. Posted in General, Life, Painting and tagged Collier, Dagnan-Bouveret, Fildes, Hogarth, painting, Rembrandt, Rondahl. Bookmark the permalink. Howard, I could use some assistance. I am trying to find a painting similar to the ones you show here. I saw it in 1978, hanging in the campus doctor’s office. It was of an older woman, (I’m thinking she was a black woman) who had apparently been asked, “where does it hurt?” because she is ever-so-slighlty drawing back the scarf that is about her shoulders and with the other hand is pointing (sort of) toward the vicinity of her heart. It’s a marvelous painting …not grand in terms of technique perhaps but well… you know. Any ideas? I don’t think the doctor is in the painting. I’m sorry, it doesn’t ring a bell with me, and there are relatively few good places to look online. I have used Wikimedia Commons on medicine in art, which is worth a look through, perhaps.